Today we check out Hells Hollow Falls at McConnells Mill State Park. The gorge starts off pretty gradually, in a formation similar to that of the natural waterslides at Ohiopyle. It then opens up into this large and descending pool. Here is the elevation change. No need to scale any cliffs for this set of falls with this nice staircase. This is also the site of an old Lime Kiln. It was restored to original state. You can even get into it! "Help! Someone get me out of here!" Be sure to check out McConnells Mill State Park. Lots of cool things to do in the park and the immediate area. We decided to spend Valentine's Day overnight at the historic Hotel Conneaut. Valentine's Day celebrations double as our anniversary date from when Brit and I first became a couple on the weekend afterwards. Six years and counting for us and we will get married in July. As we arrived at the Hotel Conneaut, the blizzard began to let up. This beautiful hotel dates back 113 years and is said to be haunted. Occasionally the lights would flicker or you would hear a random knock. Were these things the results of ghosts haunting us, or were they explainable things? That is up to you! A 1912 Pittsburgh Press Advertisement. The attractions at Conneaut Lake were built as a destination for railroad riders to escape smoky and polluted Pittsburgh. 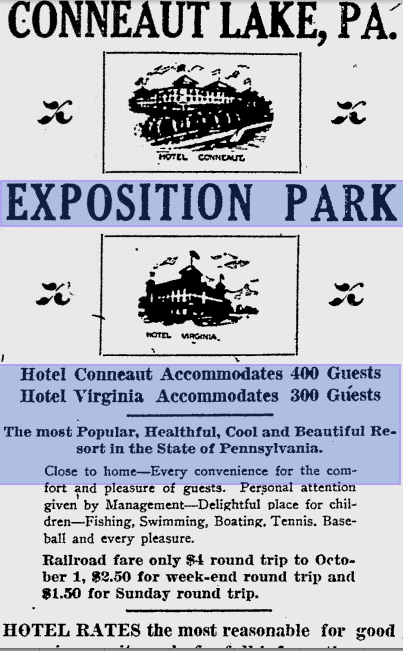 At the height of the park and hotel, 80 percent of the visitors came from Pittsburgh. Here is the Crystal ballroom. Once upon a time, Perry Como cut hair as a barber during the day at Conneaut Lake, and performed at night before he got his big break. Doris Day also got her start at the park. And the next day was beautifully sunny and clear. Judging by the looks of the weather, you would not expect the temperature to actually be -8! Time to go and venture into the snowy Conneaut Lake park! You can see the pictures on our other page. Waldameer Park's Ravine Flyer II wooden roller coaster naturally bookends a visit to Presque Isle State Park. It greets you on the way in and bids you farewell on the way out. You can see more views of Waldameer and Ravine Flyer II here on our other page. As we entered the park, whiteout conditions were occurring. This is the view of the frozen Presque Isle Bay. The bay will be home to the Joe Roots Frostbite Open Golf Tournament on Sunday February 22nd. We saw this quirky event last year and highly recommend checking it out, whether or not you are a golfer. Walking out onto the bay. I noticed this little flower bouquet pinned into the ice. I am wondering if this has to do with the tragic drowning of a teenager back in the summer, or if this is for something else. Anyone know? Now to the Lake Erie shores! It is tough to take good photos while snow is blowing towards you and onto the lens! Here you can just barely see the ice dunes that form near the shores of Lake Erie. As the waves crash to shore into the freezing edges of the lake, they freeze up into mounds and create these cool formations. Not ideal photo taking conditions, but these formations are so cool! Yeah...decent photos of the ice formations are not happening today. The Ravine Flyer bids farewell to us on our way out, and reminds us to come back in the spring when it is running again.